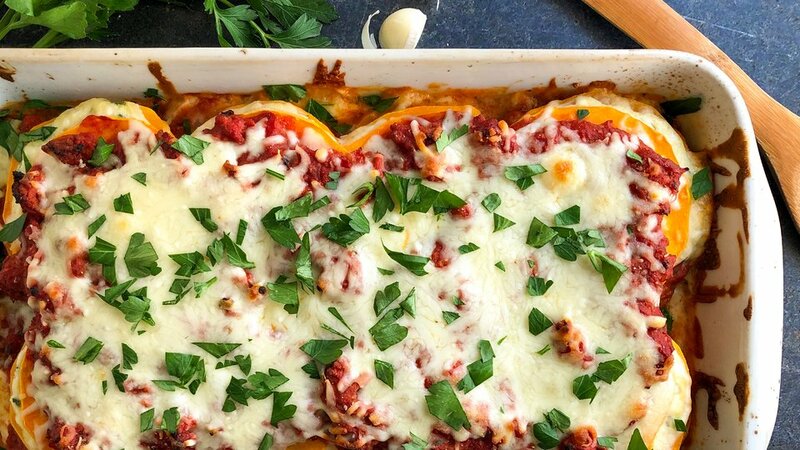 This butternut squash lasagna is lower in carbs than your traditional lasagna but has all the flavor and cheesiness you need to feel warm and cozy inside. You may even want it for both lunch and dinner—I certainly did! Peel one whole butternut squash and cut off the neck, just above where it gets wide. (You can save the wide part to use in a different recipe.) Using a sharp knife, carefully slice the squash crosswise as thin as you can, about 1/8-inch thick, to make 24-36 slices (depending on the size of your squash). Set sliced squash aside. Cook ground turkey in a skillet over medium heat until no pink remains, then add onion and garlic, cooking 1-2 minutes until fragrant. Add crushed tomatoes and oregano to skillet. Simmer on low heat for 10 minutes. In a medium bowl, combine cottage cheese, parmesan, egg, fresh parsley, and nutmeg (optional). In a 9x13 casserole dish, layer 1-1/2 cups meat sauce, followed by a layer of butternut squash slices (should overlap slightly), 3/4 cup cottage cheese mixture, and 1/2 cup shredded mozzarella. Repeat for the second layer, then arrange butternut squash slices over top and cover with remaining meat sauce. Bake for 50-60 minutes until butternut squash is pierced easily with a fork. Add remaining 1 cup of cheese to top and bake another 5 minutes until melted. Serve hot or divide between meal prep containers to enjoy for the rest of the week! Will keep in the fridge up to one week, or in the freezer up to one month.